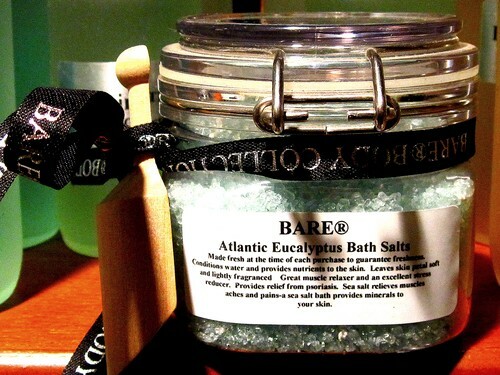 BARE Atlantic Eucalyptus Bath Salt: Made fresh at the time of each purchase to guarantee freshness. Conditions water and provides nutrients to the skin. Leaves skin petal soft and lightly fragranced. Great muscle relaxer and an excellent stress reducer. Provides relief from psoriasis Epsom salts relieve muscles aches and pains. A sea salt bath provides relaxation and mineral to your skin. Our 8 Herbal extract blend helps to revitalize the skin.